Residential Services | Mou's Maintenance & Painting Inc.
Mou's Maintenance & Painting Inc. The foundation of our company was built on providing our residential clients with quality work and customer services that are second to none. We know how important the mood of a room can be, and understand the best ways to make that happen through the coloring of the walls and ceiling. From the beginning stages of the planning process, until the moment we complete the project, we will be there with you every step of the way. Allow our expertise and understanding of our clients to assist you in finding the right colors and or designs to bring out the vibe you are trying to create. 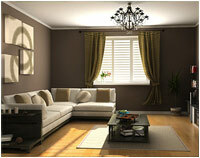 For more information on our residential painting services, please call us now!